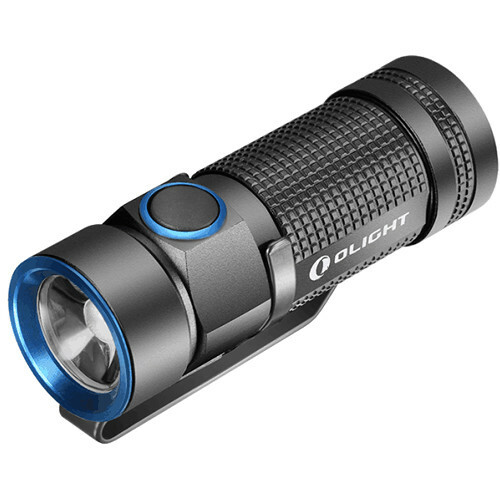 A useful addition to your tool crib, professional, or outdoor gear, the lightweight and durable Olight S1 Baton LED Flashlight is an ultra-compact flashlight featuring a powerful 500-lumen XM-L2 CW LED plus a Total Internal Reflection (TIR) optic that collimates light and provides light transmission of 90%. With four output settings from 0.5 to 500 lumens of bright white light, you can illuminate your mission, trail, or campsite. The conveniently located side switch powers the light on or off and signals your friends or rescue teams with a strobe or momentary on mode. The switch is recessed to prevent accidental activation, and if your application requires, use the built-in timer with range from 3 to 5 minutes. The light also offers Reverse Polarity Protection to protect its circuit and prevent the LED lamp from burning out when batteries are inserted incorrectly. The black housing is made of lightweight and durable 6061-T6 aluminum and a stainless steel head with impact resistance rating to 6.6'. It is sealed to offer waterproof performance and ensure flawless operation in adverse weather conditions. To offer comfort and versatility, the light also features a non-slip textured rubberized handle. A strong magnet under the tailcap allows you to attach this flashlight to metal surfaces for hands-free operation. For stability on slanted surfaces, the flashlight has a built-in anti-roll feature. Also included are a lanyard and steel pocket clip. Box Dimensions (LxWxH) 4.5 x 2.0 x 1.0"
S1 Baton LED Flashlight (Black/Blue) is rated 4.2 out of 5 by 5. Rated 2 out of 5 by Pappy one from Not real happy with this light I purchased this flashlight a couple of months ago. It has many features I really like for an everyday carry flashlight and really thought I found the best one. I keep several flashlights in my everyday carry rotation, so this one hasn't been used very much at all. However, when I do use it it works well in all of the lumen settings except for the 500 lumen mode. First of all, I found it hard to get into the 500 lumen mode. Seldom did it work right away. It always took a couple of attempts to get it on. When I did get it on, it seemed to work just fine. I never use that mode, figured it was for an if needed only scenario. The other times I use it it is at the lowest possible setting for the amount of light needed. Last night I really finally needed that 500 lumen mode. Not only was it hard to turn on, but when it did finally come on it flickered and shut off after only a few seconds of light. Tried it again, and the same problem. This morning I found that the problem still exists. So disappointed. Rated 4 out of 5 by Hillel from A very nice little light I have a lot of experience with high end flashlights, mostly Nitecore. I like this Olight, it's very nice looking, solid, seems very well made. The tail cap is magnetic, and pretty strong, so you can stick it to the fridge, I keep might stuck to my metal night table lamp-convenient and I always know where it is. I purchased the Olight CR123A battery, and output was significantly higher than with the non rechargeable battery I had, so I reccommend getting the highest quality/power battery possible. I took away one star, because the side switch should have, in my opinion, been recessed a bit more. I have had the light turn on in my pocket, no doubt the button was depressed unintentionally. It's possible it could have pressed against something else in my pocket, so if your pocket is empty less likely button will be pressed. Aside from this, it's a great light, shines a powerful beam which is basically consistent from center out, so there's really no hotspot/spill, it's just a solid wide beam, really nice. Rated 5 out of 5 by Anonymous from Great for every day carry This is me EDC light, love the variable coverage, the top level brightness, and the long battery life. Rated 5 out of 5 by Ghaas from Powerful Puncheck for a small device Fantastic key chain torch that will out perform a full size equivalent.